The first baseman category continues to shift into less valuable in fantasy baseball. The days of finding the majority of your power on this side of the infield is no longer attainable. Instead, there are multi-tool guys, but not the monsters of home runs. With that decreased value, you can find some sleepers with potential later in the draft. Here’s three first basemen with sleeper potential in the 2018 fantasy baseball draft. He’s an interesting first basemen. He’s not as dynamic as Paul Goldschmidt, who is by far the best in this category, but he offers the same kind of versatility in statistics (albeit at a lower lever). He’ll steal some bases, hit for power and maybe even contribute some RBI. His batting average scares me, as it went down in his second full season, but he’s still going to have semi-meaningful stats in runs, RBI, homers and stolen bases. That’s not bad in a position that generally doesn’t register much in runs and stolen bases. His average draft position is 68th overall and 10th among first baseman. If you’re playing by categories, he can produce better numbers than the 10th-rated first baseman. 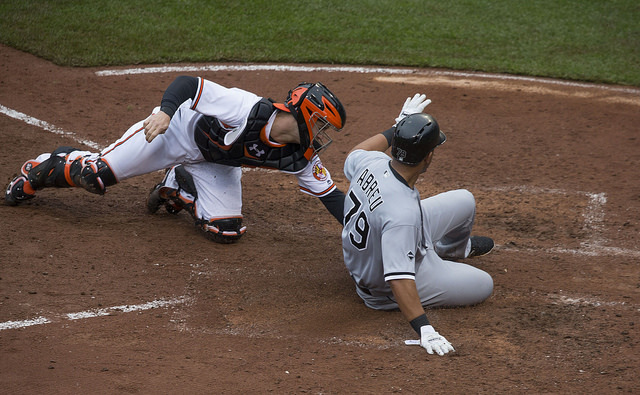 If you don’t believe Abreu can be a sleeper, then you’ll just have to ignore this selection. He has the opportunity to be a top-two first baseman, so in my mind, that makes him a sleeper with an ADP of sixth among first basemen and 39th overall. The White Sox should be better this season and they need someone to drive in runs. Abreu is reportedly in great shape and he could be looking at driving the market for a better contract in the coming years. He’s consistent, with more than 100 RBI in his four seasons in Major League Baseball. He always bats near or above .300 and he’s going to hit near or above 30 homers. With the better contract looming, this season feels like a breakout campaign. He’s already a consistent option, and getting him in the fourth round would provide major value. If you’re looking for an ultimate sleeper with major upside and a low floor, then Olson is your man. He spent half of 2017 in the Minor Leagues, but when he got his opportunity in MLB, he hit a home run in 1 of almost 8 at-bats. Can that continue in 2018? It’s highly doubtful, but if his slugging continues at a nice pace, he would be a great addition with an ADP of 18th among first basemen and 132 overall. The main issue is we don’t really know if Olson is this power-hitting first basemen, or if he got hot and will suffer the demise many batters face when pitchers adjust to them. At that low of a price, though, he’s worth the gamble, especially as a bench player to start the season.